Fajita Pete’s new Pearland restaurant will host a family-fun celebration with free food and activities to celebrate its grand opening. Enjoy fresh off-the-grill-fajitas delivered to home or office. Fajita Pete's newest location will celebrate its grand opening with free, family-friendly festivities at the restaurant, at 15718 S. Highway 288, Suite 170. The celebration begins at 3 p.m. on Sunday, February 26th, and last until 6 p.m. that evening. The event includes Fajita Pete’s famous fajitas, popcorn, cotton candy, and multiple bounce houses for kids and young adults. KRBE 104.1 will provide a live DJ, giveaways, and prizes. Pearland’s franchisee, Ram Aguilera, anticipates introducing this new restaurant concept that has a successful track record in the Houston Metro area. “Our company, Noble Restaurant Group, signed an agreement to open five stores, and being involved in the beginning stages of a concept that is about to explode into this market is very exciting,” says Aguilera. Fajita Pete’s provides fresh-off-the-grill fajitas, hand-rolled tortillas, and sides that are made-from-scratch every time. Perfect for home or office, Fajita Pete’s convenient online ordering is a fresh alternative to Chinese food and pizza delivery. The Pearland location is the seventh restaurant for the Houston-based chain. 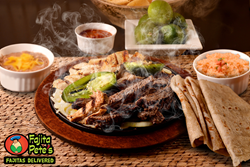 Fajita Pete’s currently has locations in Bellaire, Richmond, Memorial, Tomball, Dallas and Katy Mason. With more franchise agreements in progress, the next two locations are set for Sienna Plantation and Cypress. Every opening consist of hands-on training, founder Pedro “Pete” Mora says that training new employees reminds him of what’s truly important and that’s getting back to the basics. “My favorite part of grand openings is the excitement the event brings for both the staff and the community,” says Mora. Fajita Pete's is a Houston-based Mexican restaurant that offers fresh, made-from-scratch fajitas and a variety of authentic dishes for delivery, pick-up, catering and dine-in. Founder Pete Mora opened his first restaurant in 2002 and soon received an overwhelming amount of catering request from local companies. Envisioning a better way to fill a growing niche, he decided to close his profitable 5,000 sq. ft. full-service restaurant to focus on a 1,000 sq. ft. catering and delivery model that soon became Fajita Pete's. For more information, visit http://fajitapetes.com.